Saint Theodore was born in Constantinople in 477 and was the uncle of Empress Theodora, wife of Emperor Justinian. At some point he became an anchorite in a small hut outside the city of Antioch, where he gained the reputation of being a holy man. Justinian had called him to Constantinople to help the Church in the struggle against the sect of the Theopaschites. He then returned to Constantinople, where he found a suitable place to continue his ascetical labors, settling in a small cell on a hill in the northwestern part of the city, with water sources and a small garden nearby. Soon a group of about a dozen equally able ascetics gathered around him, as his biography states: "For there were truly holy men there, wise in the holy things, partaking of every form of the highest virtue, and educated in the study of scripture and psalmody and reading from the good teacher." Soon his disciples increased to about a hundred. With the financial help of Emperor Justinian, the Monastery of Chora was established in its preliminary form, taking its name from the "countryside" where it was located. Within twenty years of its original foundation the monastery's property stretched "from a thoroughfare, descending from the crown of the Theodosian land wall onto the shoulder and side of the valley until it arrived at the sea of the Propontis." Backed by these economic resources, the monastery now offered help to the people of Constantinople in the form of a guest house for the sick, the poor and the blind. Theodore only admitted males into this guest house, indicating his strict concern for monastic order and discipline. This concern was further borne out in a number of episodes while he served as its first abbot, including the attention he gave to the examination of initiates, his concern about the behavior of his monks during church services, and finally in the installment of one of his closest disciples as successor not long before his death. Theodore reportedly ran this community for nearly sixty years, running it as a private foundation that owed its beginnings to imperial grants and favors, and then prospered largely as a result of the energy, strong will and talents of its founder, aided by a few close advisors and the obedient community. 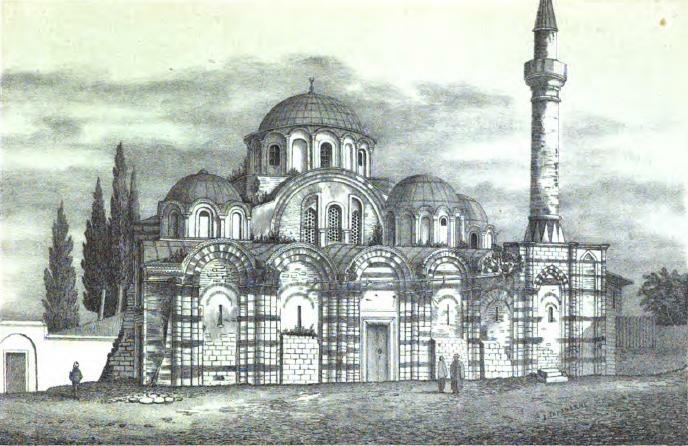 Destroyed by an earthquake in 557, it was rebuilt by Justinian, this time larger, with a domed church revetted in marble, consecrated to the Holy Virgin. At the same time were built three chapels, dedicated to Saint Anthemios, the Forty Martyrs of Sebaste and the Archangel Michael, and also a bath and a hospice, i.e. a whole complex of buildings. Today only traces of its original substructures survive.